The Master of Education with emphasis in Special Education is a 30 hour program, which includes 15 concentrated hours in the area of Special Education. The program fosters understanding of the connection between theory, research, and practice in the field of Special Education through coursework. This program also includes practicum & field experiences serving individuals with exceptional learning needs. Results from a national standardized achievement/aptitude test predictive of the ability to complete a graduate program successfully. These include: Praxis II Content Scores (6 points higher than MDE Licensure requirement) or competitive Graduate Record Examination (GRE; all sections). Note: Track options are decided upon admission to the program based on licensure/non-licensure. Track 1 M.Ed. candidates entering the M.Ed. program with no current, valid teaching license or with an emergency license only. Does NOT lead to licensure. Track 2 M.Ed. candidates entering the M.Ed. 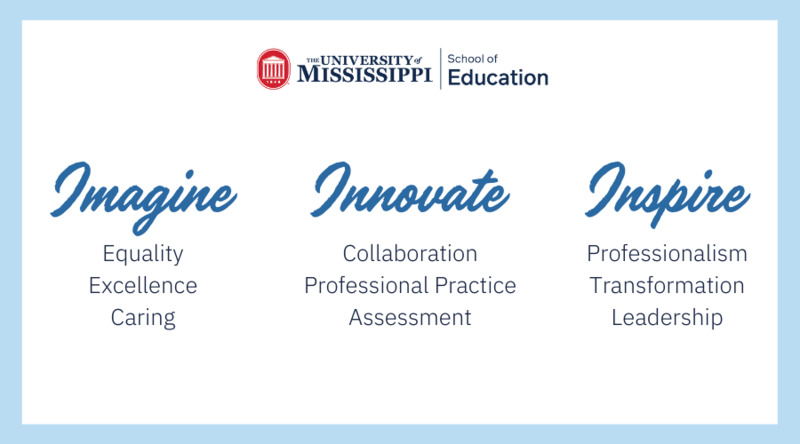 program with a valid "A" Mississippi teaching license. See the Graduate Handbook for information on completing the application process. The program prepares graduates to deliver appropriate levels of service to individuals with exceptional learning needs in various settings. Graduates from this program have found positions in schools, clinical settings, or community agencies serving individuals with exceptional learning needs. The full program of study for the Master of Education with an emphasis in Special Education is offered only at the Oxford campus. The program currently does offer some online, hybrid, and compressed video courses, but the majority utilizes the traditional face-to-face approach.